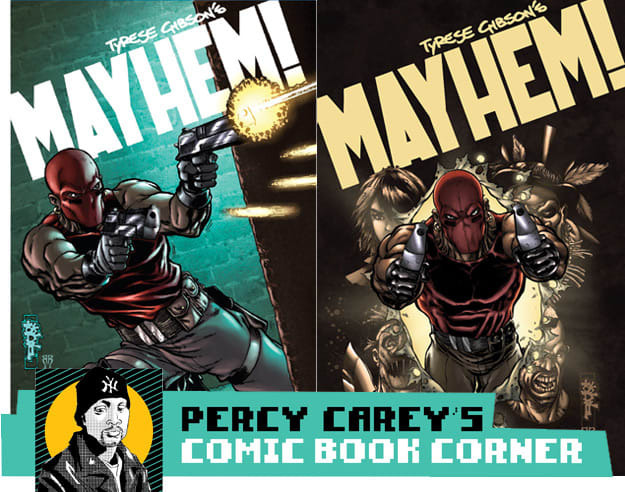 Percy Carey's Comic Book Corner: Preview 4 Pages of Tyrese's MAYHEM! Written by Mark Waid Art by Diego Olmos Cover by Jim Lee When a string of bizarre murders hits Spain's beautiful coastal city of Barcelona, The Dark Knight makes solving this crime his top priority. Full of international intrigue, high adventure and even higher stakes, BATMAN IN BARCELONA: DRAGON'S KNIGHT showcases The Caped Crusader in a different type of Gotham - but one no less dangerous! Fan-favorite writer Mark Waid (KINGDOM COME) delivers an exciting, non-stop one-shot full of surprises while Spanish art sensation Diego Olmos (SUPERNATURAL: RISING SON) beautifully illustrates his home city. Featuring a gorgeous cover by best-selling artist Jim Lee (BATMAN, SUPERMAN)! Written by FRED VAN LENTE & GREG PAK Penciled by RYAN STEGMAN Cover by DAVID WILLIAMS In this issue: HERCULES AND AMADEUS CHO DIE!!! We heard that cheap death sells comics, and we're more than happy to oblige. Though seriously, if you had to plunge into the UNDERWORLD and bring back Hercules' slain father ZEUS to counter Hera's power, could you think of a better plan? And come to think of it, have you ever noticed how... impermanent death is in the Marvel Universe? Well, while hobnobbing among the most famous Marvel deceased over the last few years, Herc and Cho learn the terrible secret why -- and why PLUTO, Lord of the Dead, is fighting-mad about it! (W) Tim Beedle (A) Armand Villavert Jr. The Muppets tell the Robin Hood legend for laughs, and it's the reader who will be merry! Robin Hood (Kermit the Frog) joins with the Merry Men, Sherwood Forest's infamous gang of misfit outlaws, to take on the stuffy Sheriff of Muppetham (Sam the Eagle) and the wicked Gonzo of Gisbourne! The 4-issue series features covers from David Peterson, the Eisner Award-winning creator of Mouse Guard, and Shelli Paroline. Written by BILL HADER & SETH MEYERS Pencils & Cover by KEVIN MAGUIRE Two stars of Saturday Night Live make their Marvel debut with an all-new story set right on the bustling, hot dog juice covered streets of New York City. Halloween is coming early this year as Spidey is knocked out during the Greenwich Village costume parade and an intoxicated reveler in a Spidey costume takes his place. Really, we don't want to say more than that. Trust us, with comic book legend Kevin Maguire (JUSTICE LEAGUE INTERNATIONAL) along for the ride, this'll be more exciting than putting a president on a comic book cover! Marv Wolfman, Denny O'Neil, Mike Barr, Tom DeFalco, Martin Pasko, Michael Fleisher, Alan Brennert, J.M. DeMatteis (w) o Dave Cockrum, Klaus Janson, Mike Netzer, Ricardo Villamonte, Frank Springer, Leo Duranona, Joe Brozowski, Tom Palmer, Luke McDonnell, Gene Day, Gil Kane, Ed Hannigan (a) o Zach Howard (c) IDW's Star Trek Omnibus collects fifteen consecutive issues from the early Marvel Comics run. Soar with your favorite characters like Kirk, Spock, McCoy, SCotty, Sulu, Uhura, Chekov, and more as they battle for the future of The United Federation of Planets... and the entire universe! All-new Zach Howard cover! Written by Dwayne McDuffie and Robert L. Washington III Art by John Paul Leon and Steve Mitchell Cover by John Paul Leon Static, currently appearing in TEEN TITANS, is back in this new collection of classic stories from his hit Milestone series! When a mutagenic gas accidentally gave him superhuman abilities, Virgil Hawkins was reborn as Static, the electrically powered teen Super Hero. And while Static tries to balance the pressures of his SChool work, after-school job and family life, he also protects his inner city neighborhood against villains including Holocaust and Commando X. Collecting STATIC #1-4 and STATIC SHOCK! : REBIRTH OF THE COOL #1-4.